The testers at Linguamatics decided to explore the adoption of a set of team values and this short series of posts describes how we got to them through extended and open discussion. If you find the posts read like one of those "what I did in the holidays" essays you used to be forced to write at school then I'll have achieved my aim. I don't have a recipe to be followed here, only the story of what we did, in the order we did it, with a little commentary and hindsight. Having got to a longlist of seven values that we were struggling to cut down further, we decided to live with them for a while and then see how we felt. I made small cards listing the values and short descriptions and distributed them to the team. I also made the values prominent on our team's pages in the company wiki and wrote about our experiment with them in our internal company newsletter. 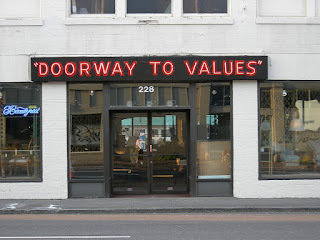 There are broadly positive feelings towards the values. They are hard to remember, perhaps because there's seven of them. They reflect what we do rather than challenge us to do more. They could be more goal-directed, or perhaps have a mission on top of them. Risk-driven should include some strong relationship with the mission. Should we say something about how we want to use the values, e.g. can we take them as an open invitation to give each other feedback? Unfortunately, despite the consensus on how we felt, there was little convergence on what we should do. So we agreed to spend another month living with the existing list and then reconvene with at least one concrete suggestion per person for how we'd like to proceed. The requirement to come with a suggestion was intended to seed discussion and help break the deadlock. One of the team later told me that it was a strong disincentive for them: because they had no suggestion they thought perhaps they shouldn't or couldn't attend. I can see that and, if I wanted to use this tactic again, I'd think very carefully about how I phrased it. Reduce the list to risk-driven, continuous improvement, collaboration. These are the three that I find myself reaching for most often. Introduce the idea of advocacy. Put transparency either in one of the categories mentioned, or as its own category. Add something concrete about testing, to make it clear that we're serious about being the testing experts in the company. Accept the proposed three values. Rewrite the definitions to include advocacy, transparency, and testing expertise. Introduce some kind of mission statement to frame the values. Check in with our colleagues who hadn't attended this meeting. One of the team offered to help with the editing, which I appreciated. We both found the task challenging but I think that two heads helped to reduce the personal bias I would certainly have introduced by doing it alone. Each take 30 minutes to draft proposals. Get together for 30 minutes to try to merge them. Review by one of our technical authors. The 30 minute merging overran as we strove to find a way to bring together two different versions of each definition. In the end we found that (a) radical candour and (b) writing both definitions in parallel on a whiteboard in different colours and then annotating them by crossing out or borrowing or rewriting together worked for us. Mission: We regard ourselves as testing specialists and aim to do relevant testing in any given context to support our colleagues and the business in providing value to our end users. Risk-driven - by taking actions that uncover relevant information and advocating for outcomes that mitigate risk or add value. Continually improving - by increasing expertise in our craft through experimenting, learning and sharing. Collaborative - by working with our colleagues in a friendly, non-judgemental and open way. In the next post I'll reflect a little.